For many British iPhone 6 owners, the excruciating wait for Apple Pay could be nearly over, with rumours suggesting the service will arrive next week on 14 July. 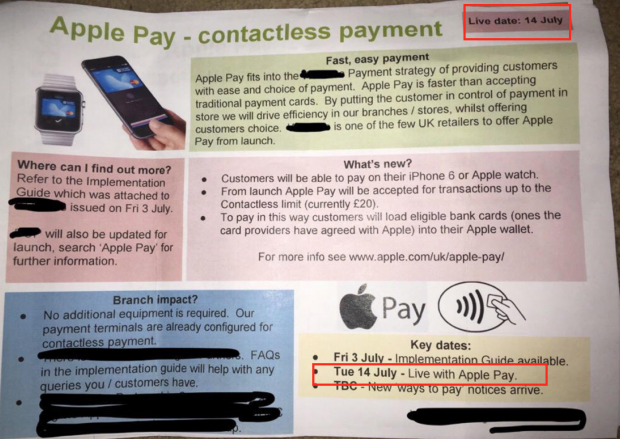 The news, spotted – as ever – by 9to5Mac, comes from Apple retail employees in the UK who have been informed that Apple Pay will go live on that Tuesday. Combine this with a leaked internal memo from Waitrose and another retailer detailing the same date, and the 14 July starts to look likely. During June’s Worldwide Developers Conference, Apple announced that Apple Pay would arrive in the UK this July. While it will initially be capped at the £20 limit that all contactless payments in the UK are restricted to, this will rise to £30 when restrictions are changed in September. The arrival of Apple Pay in the UK is a big step for Apple, as it now needs to navigate the ins and outs of a more advanced payments market. It’s still unclear whether Pay really is what UK citizens want – contactless cards have taken off, but mobile wallets have largely remained stagnant.